Nympsfield Long Barrow is a Neolithic burial mound dating to about 2900 BCE, in a superb setting atop a high ridge of the Cotswold escarpment, with views out over the Severn Valley towards Wales. The barrow internal burial chambers have been exposed for easy viewing allowing visitors to get a good sense of the chamber layout. When the barrow was excavated the remains of at least 16 skeletons were found, in addition to remains of Neolithic pottery and carved bone. Litlle of the mound remains, and the barrow has been oddly truncated. It was originally a tapering barrow up to 27 metres in length, with a horned forecourt area. 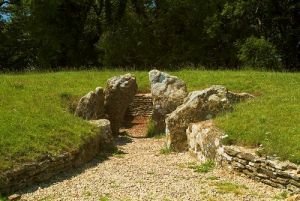 Within the exposed mound are three chambers arranged like a cross, formed with local stone slabs and drystone walling. 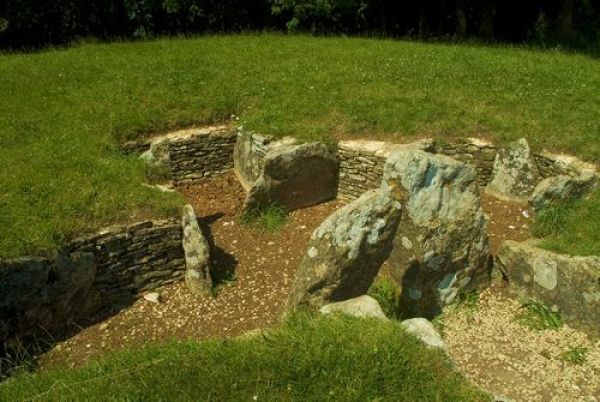 This type of burial chamber is known as 'Cotswold-Severn', and there are over 100 such barrow remains in the Cotswold region. The barrow may have avoided damage during the medieval period due to a local belief that it had been at one time a leper hospital. Nympsfield is close to another long barrow; Hetty Pegler's Tump. Though owned by English Heritage the site is managed by Gloucestershire County Council. There are a parking lot and a picnic area on site. Location: Located directly on the B4066 1 mile northwest of Nympsfield village, almost opposite the drive to Woodchester Manor.